The Annual New Year’s Day Chilly Chili Run attracted a large crowd to Orange on Sunday morning. A total of 508 registered and 479 finished the race. Once again, Town Employees, Elderly Outreach Agent Denise Stein and First Selectman’s Administrative Assistant Mary Shaw competed. Runners, walkers, strollers and a couple of pooches participated and did their best to complete the race, which supports the Amity Teen Center. 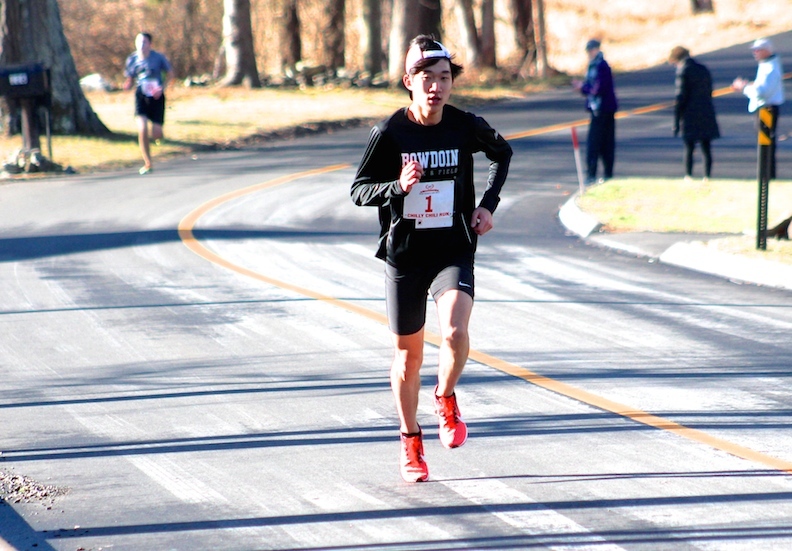 Wearing bib #1, the overall winner was Calvin Park, 21, of Trumbull, who finished the race 16:07. He improved his time by :23 seconds over last year’s win. This is Park’s third win in this race. In 2014, at the age of 18, he ran it in 16:43.36. Orange resident Timothy Cannata, 19, an Amity Grad and former track “star” came in second at 16:31 , followed by 22-year-old Orange resident Dan McCabe at 16:57. The first female finisher was Blanca Lucero, 39, of New York at 20:12, followed by Chelsea Krombel, 29, of Wallingford at 20:59, and in third place, Milford resident Colleen Beirne, 47, at 21:18. The oldest female runner was Betty Holroyd, 90, of Wallingford, who finished at 53:27. The results are now posted on Hi Tek Racing’s website. Sunday’s weather is supposed to be dry and pretty comfortable, so why not start off the New Year with a 5k Road Race? Organizers from the New Year’s Day Chilly Chili Run will have Early Packet Pickup and Late Chilly Chili Run Registration at the High Plains Community Center lobby today, Friday, December 30, from 9 a.m. to 1 p.m.
Fees are as follows: $27.00 for runners; $15.00 runners 12 and under; $15.00 for the 2 mile fitness walk. For more information, e-mail Jane Opper at chillychilirun@hotmail.com or call 203-795-9351. The Chilly Chili Run, Connecticut’s Favorite 5K is 18 Years Old: Have You Registered Yet? Around Town, Charity Events, Home Comments Off on The Chilly Chili Run, Connecticut’s Favorite 5K is 18 Years Old: Have You Registered Yet? If you’d like to ring in the New Year with a “hot chili brunch” and help out a non-profit organization at the same time, please sign up to walk or run in the People’s United Bank 2015 Chilly Chili Run to benefit the Amity Teen Center. This year will mark the 18th running of the Race. The 5K (3.1 miles) Run and Fitness Walk will begin at 10:30 a.m. on New Years Day at the High Plains Community Center, 525 Orange Center Road in Orange. The registration will be $27.00 for runners and $15.00 for runners 12 and younger, and people doing the Fitness Walk. You can register online at www.hitekracing.com up until December 26. Applications also are available at the Orange Park and Recreation office. Race organizers will have a table set up in the front lobby of the High Plains Community Center on Wednesday, December 31 from 9:00 a.m. to 1:00 p.m. for an Early Packet Pickup and Late Registration. 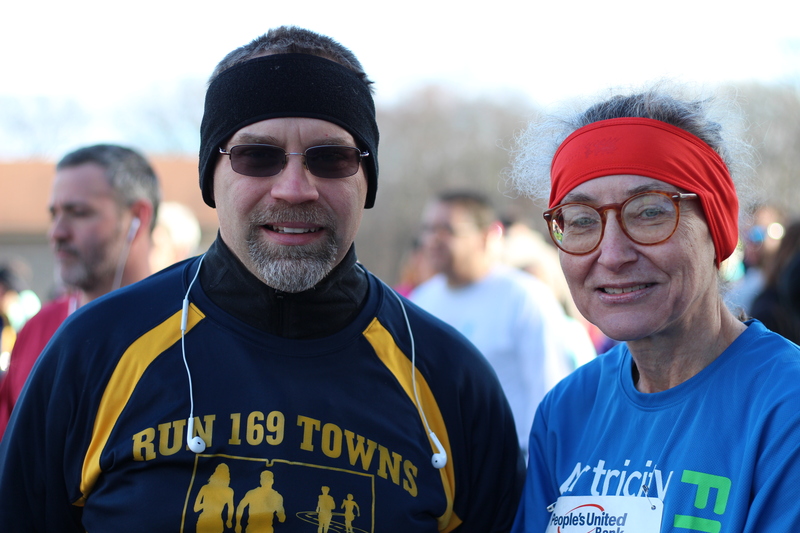 In addition to serving a “hot chili brunch” to all of the participants, another highlight is the Chilly Chili T-shirt, voted the Favorite among Connecticut Runners. Everyone who has pre-registered and the first 100 to register on the day of the race will be guaranteed a shirt. For the past few years the Chilly Chili Run has been the only official 5K race to have three 90+ year old runners register and complete the race. All of the proceeds will go to the Amity Teen Center, a 501 c 3 organization that was formed in 1987. The Teen Center is located at 10 Selden Street in Woodbridge. The business is located in the Peck & Post Plaza 2nd floor. Only Wu is a licensed Massage therapist. Currently, the windows are blocked with paper and should be removed after it is open for safety sake. The police must complete background checks prior to approval. Mr. Han does not really speak English so Su Fang Wu translated the selectmen’s questions for him. • Selectman Ralph Okenquist mentioned that First Selectman Zeoli was voted the 3rd best politician in CT in New Haven Living Magazine. • Zeoli and John Carangelo toured Peck Place School today and even though it’s not 100% complete, it will be ready enough for the start of school on Sept. 2. Cabinetry will be the last thing installed. 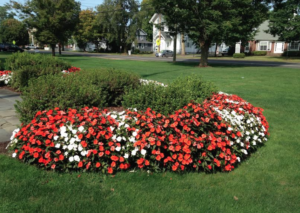 • Zeoli gave a thumbs up to Mike Luzzi for his ability to be on top of four huge projects in town. • The death of K-9 Major will be covered by the town’s insurance company. • Fred Trotta is retiring and his replacement is already on the job learning the ropes. • Sept 1 all town departments and the transfer station will be closed. • Sunday Sept. 28, the Beardsley Zoo will host Orange Day from 10 a.m. to 4 p.m. Admission for Orange Residents with proof of residency will be $5. • UI tree trimming Rt34, Dogwood and Racebrook. Then Cart Lane, Cedar Grove, Old Cellar roads are next on the list. • Rocco, the barber at Country Squire Barber Shop at 661 Orange Center Road is celebrating 50 Years as licensed barber. Vincent Marino says town ordinance states no one can discharge a firearm without a permit from the Police Department. Police Chief wants to work directly with businesses with indoor ranges. The sound proofing is so good now that no one would ever hear anything. Marino will draft the change and present to the Board at the September meeting. Bond Construction Oversight – Selectman Goldblatt — road milling work has been completed, everyone seems pleased with the results. Still money left in the bond for future work. chip sealing is being done. There is a culvert under Old Grassy Hill Road near Wright’s Pond that must be done. The road will be closed for quite a while so plan to use alternate routes around the area. Wright’s Pond will be pumped out so don’t be concerned if you see that happening. Potential Land Purchase Discussion (enclosure) No Action Will Be Taken tonight. If you are competing in the annual Chilly Chili Run tomorrow (New Year’s Day) be sure to prepare for the cold weather. I found these tips for running in cold weather HERE and wanted to share portions of it with you — go to the site for FULL text and details. 1. Dress in thin, wicking layers. 2. Protect your hands and feet. 3. Pay attention to temperature and wind chill. 5. Don’t forget to cover your head. “On really cold days, make sure you monitor your fingers, toes, ears, and nose.” Medics are available at the Chilly Run, and there are stations along the route where you can ask for help is you suspect possible frostbite, do NOT wait until it’s too late. 8. Don’t stay in wet clothes. 9. Take it easy when it’s frigid. We will sorely miss Doc Whitney at this year’s race. The annual Chilly Chili Run 5k road race will take place on Wednesday, Jan. 1. Over the past few years, we’ve seen balmy to freezing temperatures, sunshine and drizzle, but this year it is truly going to be a Chilly Run. Here is this week’s weather forecast for Orange from the National Weather Service. Prepare to bundle up, we’re looking at freezing to below freezing temperatures. Mostly cloudy, with a low around 32. West wind 6 to 15 mph. Monday Mostly sunny, with a temperature falling to around 28 by 5pm. Northwest wind 7 to 16 mph. Monday Night Partly cloudy, with a low around 16. Northwest wind 6 to 9 mph. Tuesday Partly sunny, with a high near 32. Calm wind becoming southwest 5 to 8 mph in the morning. Tuesday Night Partly cloudy, with a low around 20. West wind 5 to 8 mph. New Year’s Day Mostly cloudy, with a high near 32. Wednesday Night A chance of snow after 1am. Cloudy, with a low around 18. Chance of precipitation is 30%. Thursday A chance of snow. Cloudy, with a high near 21. Chance of precipitation is 50%. Thursday Night A chance of snow. Cloudy, with a low around 17. Chance of precipitation is 50%. Friday A chance of snow. Mostly cloudy, with a high near 19. Chance of precipitation is 30%. Friday Night Partly cloudy, with a low around 4. Saturday Mostly sunny, with a high near 27. Saturday Night Mostly cloudy, with a low around 18. Sunday Partly sunny, with a high near 40. A few first time 5k runners will be joining the masses at today’s annual Chilly Chili Run. The temperature is predicted to be appropriately chilly so you may be tempted to overdress to keep warm, which will quickly backfire on you. Dressing in layers that you can easily remove if necessary as you go may be a better strategy. According to writer Rick Morris from Runningplanet.com three specific layers, each with its own purpose is the way to go. The Chilly Chili Run has the most pre-registrations in its history, if the weather cooperates it should be a lot of fun with 5 runners over the age of 90 hitting the pavement with all the young-uns. The race begins at 10:30 a.m. at the High Plains Community Center. Registration for runners is $25 now and on the day of the race. Registration for the Fitness Walk is $12 now and on the day of the race. If you’re not running, come on down and cheer the participants on along the route — and dress accordingly.